You do not need large amounts of flour and water to create a starter. It works just as well with a few tablespoons of each as it does a cup of each, and is much less wasteful. You do not need to add pineapple, grape, or any other kind of juice to your starter. Feed your starter regularly if it is not in the refrigerator. It can be stored in the refrigerator for quite a while without feeding. Anything else you need to know comes from the experience you will gain from maintaining the starter and using it. It may take a while for you to get the hang of it, but unless you manage to do something drastically wrong your mistakes should be edible and people will still want to be your friend in hopes that you will share your efforts with them. In case you have been thinking at all about dipping your toe in the water, I thought it might be helpful of me to present a brief tutorial with pictures on creating a starter. Once it is up and going, you can either leave it out and feed it regularly or put it in the refrigerator and bring it out a few days before you plan to use it. Either way, once you have done it for a while it will not be so scary and you will wonder why you ever feared it in the first place. 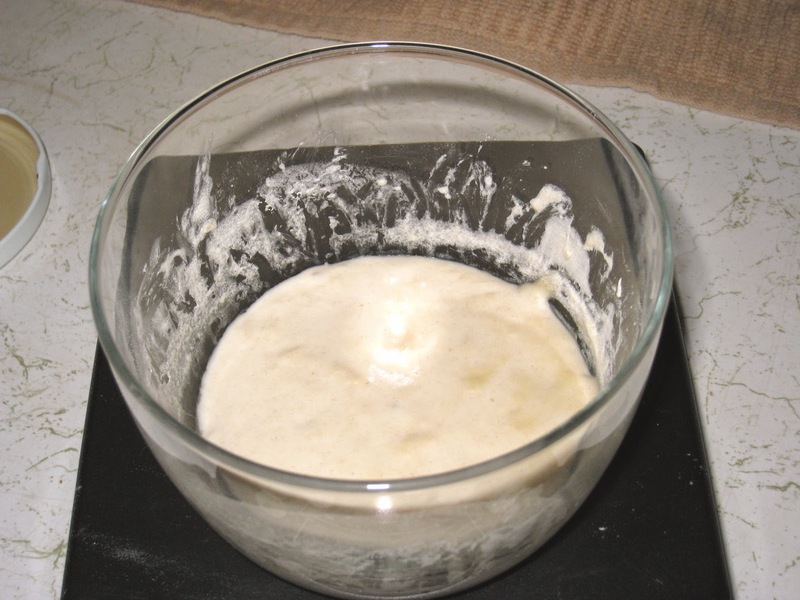 Since I started playing with sourdough I have only used commercial yeast a few times, and that was in order to make enriched breads where the added ingredients retard the sourdough's rising ability. 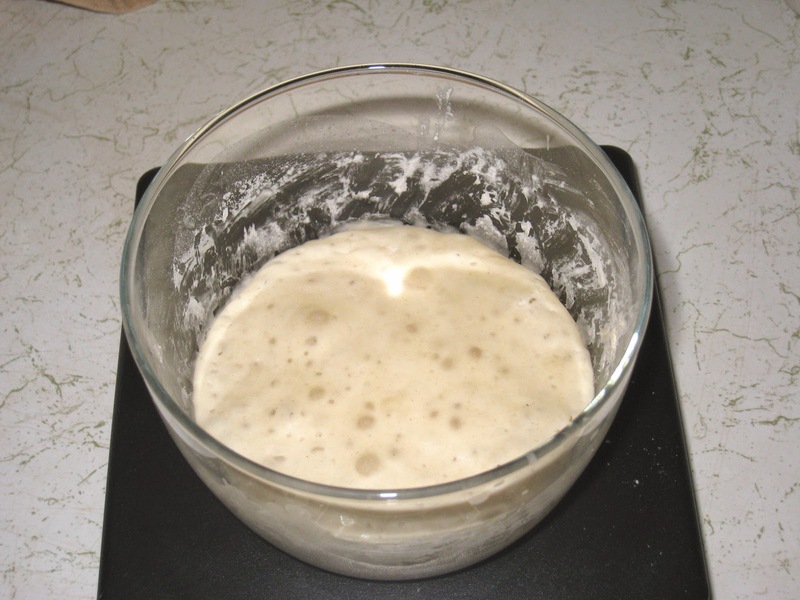 Otherwise, I have gotten adept at converting recipes that use commercial yeast to sourdough thanks to this post from Clotilde at Chocolate & Zucchini. I have even found some recipes to help use up excess starter. Ready to jump down the rabbit hole? Follow me. Note: I measure my ingredients by weight (and I highly recommend that you do the same). For those who use volume I have done my best to give conversions but fair warning: I may have gotten some wrong. The best rule of thumb when measuring by volume is that you want to use half as much water as you use flour. On the first day I combined 20g of water with 10g of flour (that's about a tablespoon of flour and a tablespoon of water if you're working by volume). This is actually twice as wet as I keep my starter, but I think it helps the bacteria get started if the initial environment is on the wet side. Stir the two together in a small bowl or jar (I covered mine with cheesecloth so it could breathe but if you use a jar and set the lid on loosely that would work just as well) and let it sit out until you start to see some bubble action on the surface of the mixture, which could take a day or so. This picture was taken right after I got started so there has been no action yet. About twenty-four hours later I could see a few tiny bubbles, but overall the mixture looked about the same as it did when it was started so I just stirred it but did not add anything to it. The third night I could see lots of tiny bubbles so I decided to feed it. At the same time, I wanted to bring the ratio of flour to water where I wanted it to be, which was equal parts of flour to water. This is the only time that I add to the starter without removing anything, as I wanted to bring it to 60g (half a cup) total. 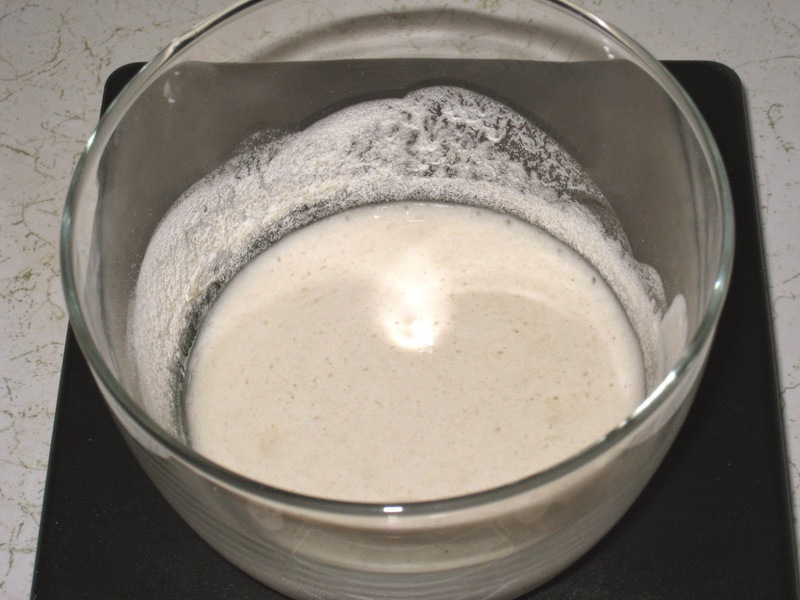 To the existing starter I added 10g (about half a tablespoon) of water to 20g (about one sixth of a cup) of flour. I stirred it together, covered it with the cheesecloth, and let it sit. Moving forward from here, I started checking the starter every twelve hours. If you do not see any noticeable activity by day three and you are getting worried, you can try using whole wheat or rye flour (whole wheat flour is available in bulk if you do not use it regularly and don't have some around) instead of the all-purpose flour for one or two feedings. That worked for me the first time I made a starter. After it takes off you will be able to go back to all-purpose or bread flour. On the morning of day four I could see that some activity had occurred, but no bubbles had broken through the surface so I just stirred it and left it alone. When I came back to check on it that night the bubbles had broken through the surface, so it was feeding time! 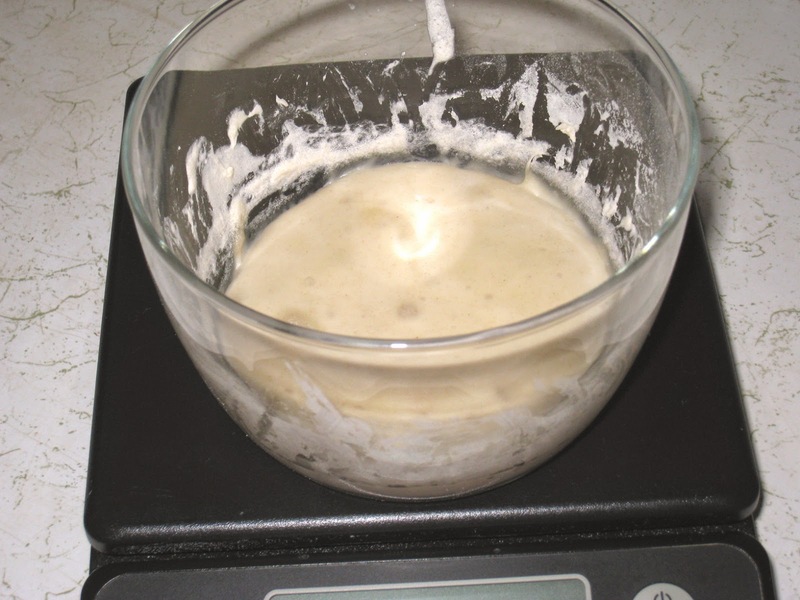 For this feeding on, you want to remove about two-thirds of your starter so that you are only adding amounts to bring it to its current level. 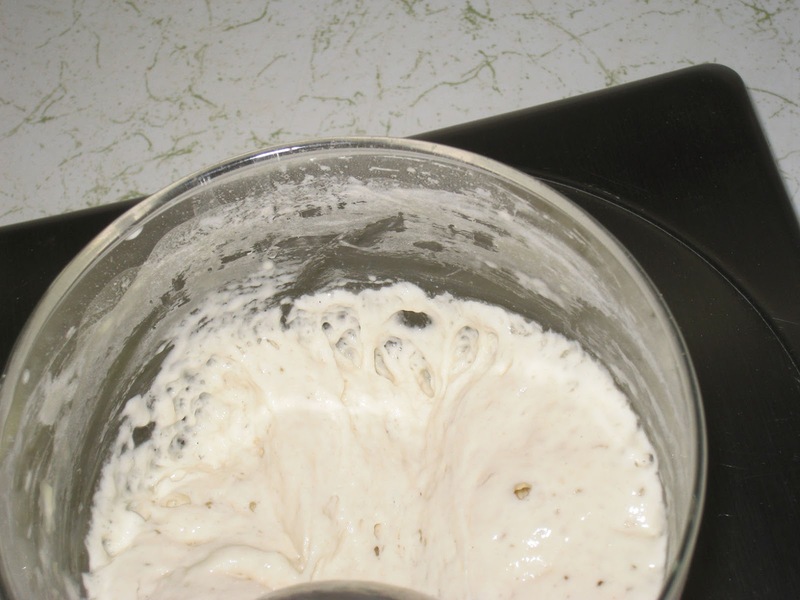 Because the starter wants its weight in flour and starter, if you don't remove two-thirds of it before feeding it you will be drowning in starter in no time at all. 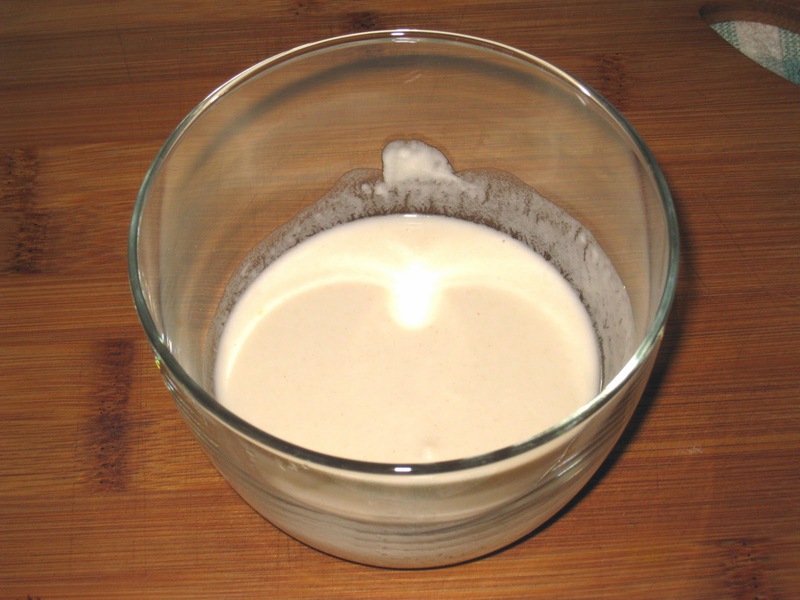 You can either store the excess starter in a loosely-capped jar in the fridge to make pancakes or biscuits or banana bread (future posts), or you can just toss it. 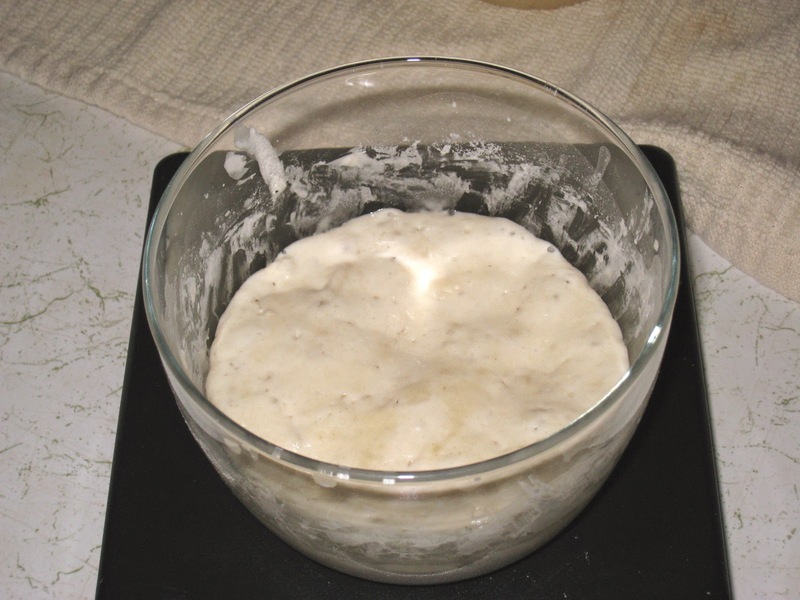 I had a hard time tossing it at first but I keep my starter small so I am more comfortable just getting rid of it if I already have excess starter in the refrigerator. That is something you will get a feel for as you get more comfortable working with it. Back to the feeding. The ratio of flour to water was now where I wanted it so I discarded two-thirds (40g/a little less than half a cup) of the starter and added 20g (about a tablespoon) of water and 20g (about one-sixth of a cup) of flour. You may notice there was actually a little more starter than the water and flour I added; that is just something that I do. I figure the stuff that has dried onto the sides of the jar shouldn't count as the total weight so I always keep the ratio just a tad high on the starter side. I stirred everything together and let it sit for another twelve hours. On the morning of day five, I could see that there had been more activity than in the previous 24-hour period, but it had not gone crazy with the bubbles so I decided to leave it for another twelve hours before feeding it again. At this stage I wanted it to be good and hungry! So I stirred it again and left it alone. That night, as you can see, there was much more activity. For the first time my starter looked the way starter should look. It had doubled in size and was full of bubbles. I was very excited as I removed two thirds of it and fed it another 20g (about a tablespoon) of flour and 20g (about one-sixth of a cup) of flour. I stirred it and left it to work its magic yet again. I just realized that I did not take pictures of the starter right after I fed it so you could see the difference in size. 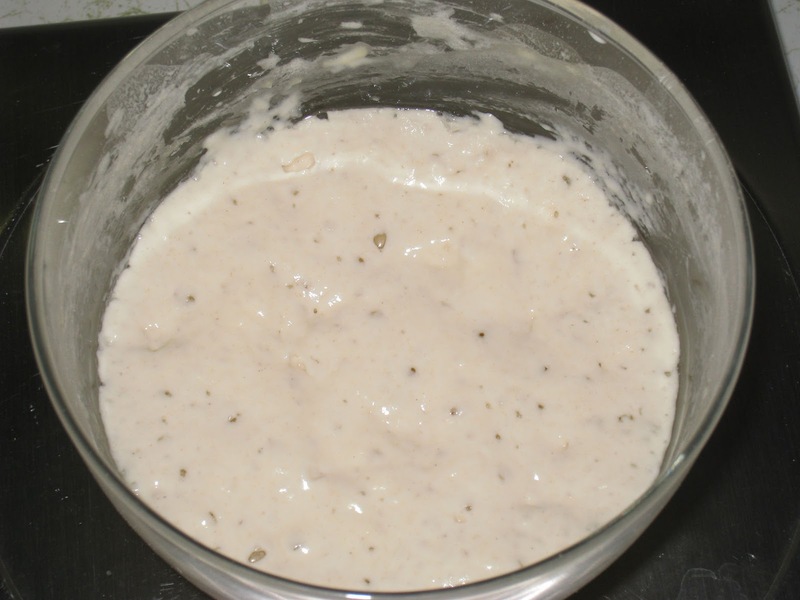 See the photos at the bottom of the post to get an idea of how your starter will look just after feeding and then twelve hours after that. As you can see, it was quite bubbly the next morning and ready for its first twelve-hour feeding. That meant it was almost ready for use. 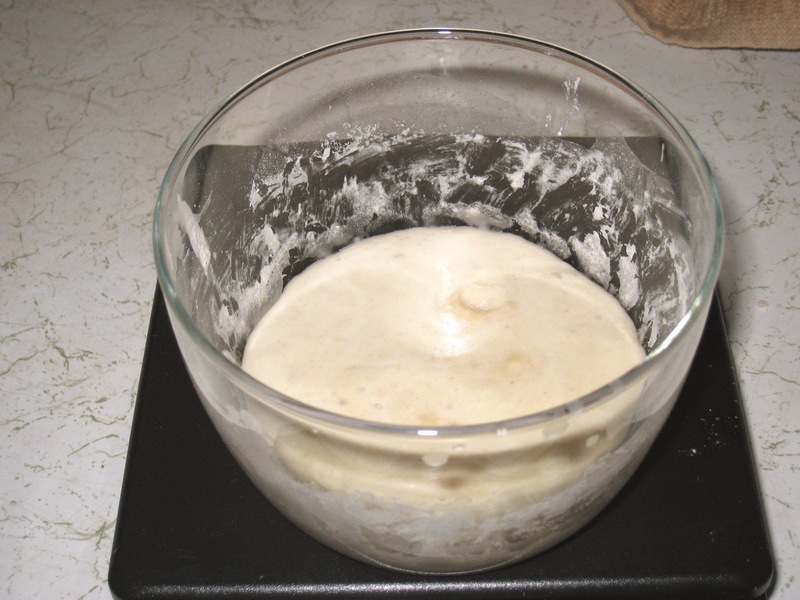 I have read that you should let a starter go through three rounds of active feeding before you use it, so I gave this one more feeding on Friday night, and then on Saturday I was ready to make my bread. Depending on the makeup of your tap water, there may be chemicals (such as chlorine) that will interfere with the development of the bacteria (or even kill it). I use filtered water that I keep in a jar at room temperature for my feeding and for my breadmaking. You will hear that you should NEVER use metal with sourdough. I use metal spoons to feed my starter and have never had any problems. I have seen folks who use metal bowls to mix their dough and let it rise and they do not seem to have any problems with it either. I do agree that you should not keep your starter in a metal bowl, as that does give the metal time to interact negatively with the starter. You can use either plastic or glass containers for your starter. I like to use glass because I am not sure what, if any, chemicals from the plastic leach into the starter given the constant contact between it and the container. So I am more comfortable with glass, given my better safe than sorry approach to life. Sometimes you will feed your starter in preparation for baking and something will come up that will prevent you from using it. When that happens to me I cover it with plastic wrap and put it in the refrigerator. If I am baking the next day I just bring it out and up to room temperature and make my bread. If it is two days, I bring it up to room temperature and feed it once before I use it. Any longer than that and I use the general rule of feeding it until it doubles successfully three times before using it. If you store your starter in the refrigerator, I have found that in order to get it up to speed as soon as possible it likes to be fed once a week (give or take a day on either side of that). It can go much longer than that without being fed, but it will require more time and attention to get it back up to full strength. I was not happy about how much flour I was wasting feeding my starter twice a day, so after a while I cut it in half. My starter now consists of about 15g (about a scant tablespoon) of starter, 10g (about half a tablespoon) of water, and 10g (about a tablespoon) of flour. When I am ready to bake my bread, I will build it up to the amount that I need. 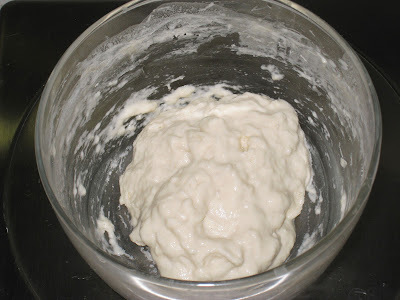 I started and fed my starter with all-purpose flour and used that for the first year or so, and then it made more sense to me to use bread flour. Both work, but I think the additional gluten in the bread flour makes the starter stronger and helps my dough to rise faster. These are photos I took more recently of that same starter in the pictorial above. The photo at the top of this post shows what it looked like twelve hours later. And this photo shows what it looks like when you start to stir it. I took this picture to show how strong the starter is - you can see the gluten strands that formed as I pulled the spoon across the surface. This baby is ready to make some bread! Ok, I think that's enough for this first post. I have a lot of recipes to share, but I wanted to get the basics posted first, just in case someone is feeling brave and inspired by my successes to create a starter of their own. I hope this gives enough information to help you get started! Sourdough Home, especially the FAQ page. 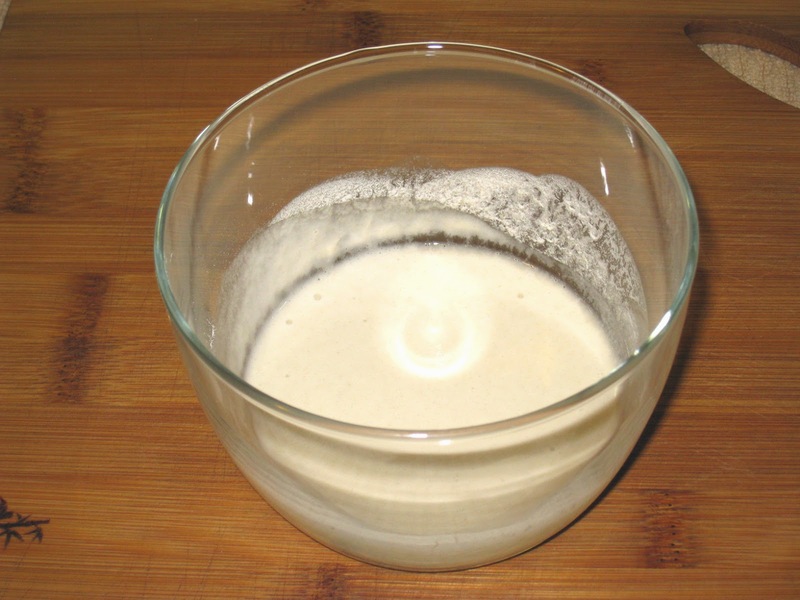 Some great information on sourdough basics can be found here. The recipe on this page is the first recipe I made. I found it extremely user friendly and nonchallenging. In the extremely unlikely case that my little tutorial was not enough to encourage you, you can find another day-by-day guide at Serious Eats.